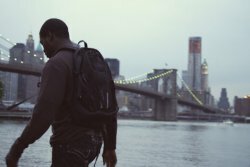 Among the counterfeit watches and knock-off handbags that litter New York's Chinatown markets, a West African immigrant has found his corner of the American Dream turning small cons on unsuspecting tourists. But can you survive in an unscrupulous world without bargaining away your own soul? Geoff Bailey completed his MFA in film production at Columbia University's School of the Arts, where he was the recipient of the prestigious William Goldman Fellowship in Screenwriting. He works as a director with Loyalkaspar. His work has been seen on HBO, Showtime, The Daily Show, A&E, Travel Channel and numerous other networks. His work for Showtime's hit show Dexter earned him a BDA Gold Medal. Writer/Director Geoff Bailey and Producer Jason Wood will be available for Q&A after the screening.